Smart Shortcuts: Job + College = Early Graduation! Want to save time and money and earn your degree? Go to work! If you’re in college, having a job in the field of your major can save you time and money, and help you complete your degree early. Many college programs require work experience to complete different major tracks. 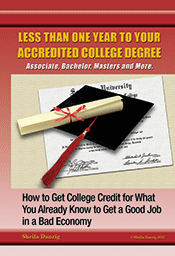 Even if yours doesn’t, you can still earn college credit through work experience. Post-graduation, employers are looking for education, but also looking to see if you have the experience to apply what you learned in school to a workplace environment. Working through school will not only help you finish early, but also put you in better standing as you job hunt after graduation. When you work in the field of your major, your work experience not only counts towards completion of your degree, but can also count towards your major. To learn more about how this works, visit TheCareerPeople.com. You may be closer to graduation than you think!